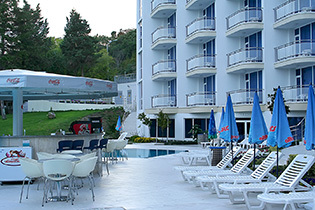 The pool bar is a favorite spot for guests of Aqua Azur Hotel in the summer. Refreshing and soft drinks are served directly in the pool. Instead of going for a cocktail, the cocktail comes to you. The atmosphere of the pool bar is light, pleasant and makes you pamper, relax and completely exude the routine.